The Bongo License covers an area of 453 km2 adjacent to the regional Bole-Bolgatanga Shear and is dominated by three major intrusive complexes, predominantly granitoids of intermediate to foliated felsic basin types intercalated with mafic volcanic flows (Figure 4). The Bongo License area is related to the northeast trending regional gold rich Markoye Fault Corridor on which some major gold discoveries in Burkina Faso are located including, B2Gold’s Kiaka Gold Mine, West Africa Resources’ Tanlouka Gold Project, Orezone Resources’ Bombore Gold Mine and IAMGOLD’s Essakane Gold Mine. Bongo is approximately 28km northwest of the Company’s 7Moz Namdini Gold deposit. 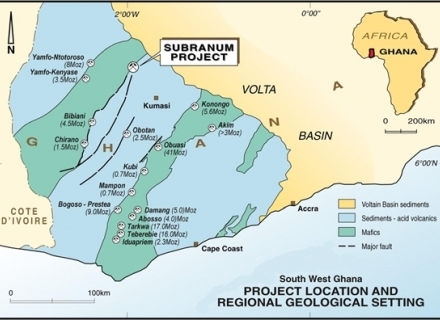 Six target areas were initially identified from the airborne geophysical survey. 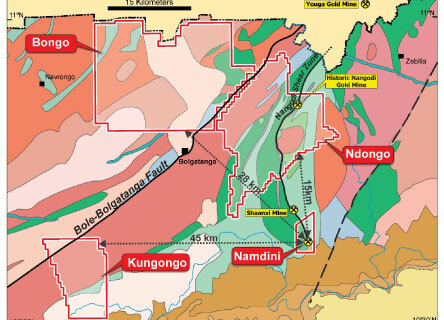 Three of these target areas totalling 26km in strike length within the north western, north-eastern and south-eastern parts of the Bongo License were generated from auger soil anomalies, previous air magnetic interpretation, mapping and ground truthing over the license. Reconnaissance RC drilling is expected to commence across all anomalous targets.